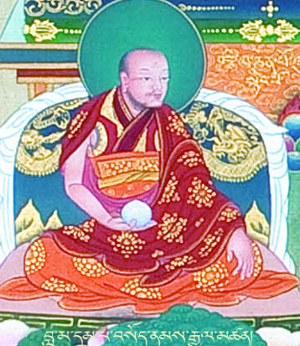 Lama Dampa Sönam Gyaltsen (Tib. བླ་མ་དམ་པ་བསོད་ནམས་རྒྱལ་མཚན་, Wyl. bla ma dam pa bsod nams rgyal mtshan) aka Sakyapa Sonam Gyaltsen (1312-1375) was the author of the famous historical work known as The Clear Mirror: A Royal Geneaology (rgyal rabs gsal ba'i me long). Among his teachers were Butön Rinchen Drup, from whom he received the empowerment of Kalachakra, and Drakpukpa Sönam Pal. He was a teacher of both Jé Tsongkhapa and Longchenpa. He wrote a famous commentary on the Bodhicharyavatara in 1338. This page was last edited on 27 February 2017, at 04:47.